Welcome to the LitCharts study guide on William Shakespeare's Romeo and Juliet. Created by the original team behind SparkNotes, LitCharts are the world's best literature guides. A concise biography of William Shakespeare plus historical and literary context for Romeo and Juliet. A quick-reference summary: Romeo and Juliet on a single page. In-depth summary and analysis of every scene of Romeo and Juliet. Visual theme-tracking, too. Explanations, analysis, and visualizations of Romeo and Juliet's themes. 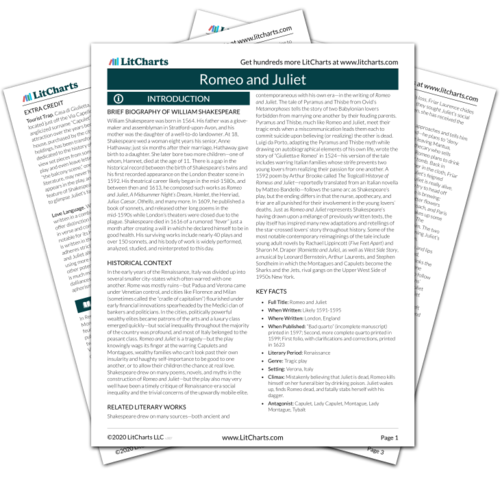 Romeo and Juliet's important quotes, sortable by theme, character, or scene. Description, analysis, and timelines for Romeo and Juliet's characters. Explanations of Romeo and Juliet's symbols, and tracking of where they appear. An interactive data visualization of Romeo and Juliet's plot and themes. As with many other of his plays, Shakespeare adapted his version of Romeo and Juliet from earlier sources. Shakespeare's most direct source was an English narrative poem published in 1562 by Arthur Brooke, which was itself a based on a French version of an Italian story. Shakespeare's play and Brooke's poem share many similarities of plot, including how Romeo and Juliet met and died. However, while the plots are similar, Brooke's version is generally considered to be plodding, while Shakespeare's Romeo and Juliet is one of the most exciting plays ever written. Shakespeare transformed the story in a variety of ways. Three of the most important include cramming a plot that in Brooke's poem took nine months to unfold into just four frenetic days, having Tybalt kill Mercutio, and having Romeo and Juliet's wedding day occur on the same day that Romeo is banished. But just as important in creating the ecstatic intensity of Romeo and Juliet is the unparalleled power of Shakespeare's language. In addition to its similarity to earlier versions of the Romeo and Juliet story, Shakespeare's play is also similar to the story of Pyramus and Thisbe, which was best told by the Roman poet Ovid in his Metamorphoses. Shakespeare was not only aware of the similarity between the stories of Romeo and Juliet and Pyramus and Thisbe, he explicitly references Pyramus and Thisbe within Romeo and Juliet. Setting: The Italian cities of Verona and Mantua during the Renaissance (around the fourteenth century). Climax: Romeo and Juliet's double suicide in the Capulet tomb. Shakespeare or Not? There are some who believe Shakespeare wasn't educated enough to write the plays attributed to him. The most common anti-Shakespeare theory is that Edward de Vere, the Earl of Oxford, wrote the plays and used Shakespeare as a front man because aristocrats were not supposed to write plays. Yet the evidence supporting Shakespeare's authorship far outweighs any evidence against. So until further notice, Shakespeare is still the most influential writer in the English language. Florman, Ben. "Romeo and Juliet." LitCharts. LitCharts LLC, 22 Jul 2013. Web. 23 Apr 2019. Florman, Ben. "Romeo and Juliet." LitCharts LLC, July 22, 2013. Retrieved April 23, 2019. https://www.litcharts.com/lit/romeo-and-juliet.